A while ago I asked for help to recreate a hat owned by a co-worker, one that he'd bought somewhere. I tried a number of techniques and variations, but nothing was working exactly as I would like. The biggest problem was getting the earflaps so that they would hug the head as opposed to needing ties to hold them in, and trying to get the exact shape. 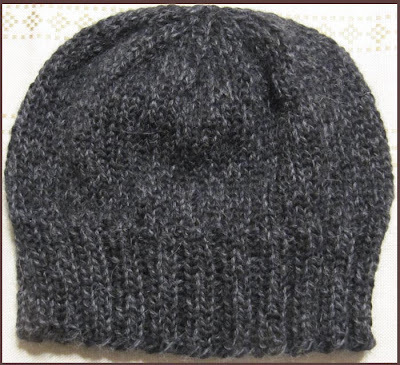 Eventually, I just gave up as it was taking too long and I made a regular ski cap/toque-type of hat. Carlisle, my coworker, wanted a yarn that appeared tweed-like....black with flecks of a light color. I found the perfect yarn: 100% baby alpaca - very soft and cozy and hugged the head perfectly. He loved the hat and other co-workers "volunteered" to take a hat if I planned to knit more. I don't have any immediate plans!! Work 15 rounds in K2, P2 rib. Work 22 rounds in Stocking Stitch. K1, *K2tog. to end of round (6 sts). Break yarn and thread through sts, tighten and fasten. The Yarn: Plymouth Yarn "Baby Alpaca Ampato"
Used less than a skein. 16" circulars, then double-pointed needles.